Hope everyone got a few good black friday deals today, because I have a "special" treat to finish off the day for you. 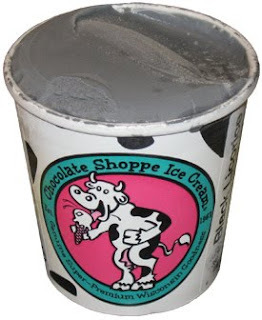 The other day a stroke of brilliance hit me: Save the Black Licorice flavored Chocolate Shoppe Ice Cream for Black Friday. Aren't I tricky? Hey, you take whatever excuse you can to eat ice cream and then run with it. As you might suspect, I was a little afraid. I have never seen licorice flavored ice cream in these parts. I ate my fair share of twizzlers as a kid, and I still love a fresh box of Good & Plenty, but licorice ice cream? Those two things don't go together in my world. Even if I had seen licorice flavor, I doubt I would have bought it. I want to leave the ice cream stand happy, and licorice would have been too big of a gamble for me. Well, the Ice Cream of the Month Club is standing by to broaden our horizons. Besides the first two tame selections this month, I found black licorice in my shipment. I didn't even know what color it would be. I've never seen black ice cream, but what other color could it be? Let's find out! Ahhhh, that's better, I like my piles of gunk to be happy. Wait a minute, I'm suppose to eat this stuff, not play with it. I took a small bite, and then another one. I wasn't really sure how I felt about it. My daughter on the other hand knew exactly how she felt about it: "YUCK!" She was thrown off by the color but was a good sport and tried a quick bite (she went on to have some peanut butter cup ice cream). I was a trooper and had several more bites. I tried to enjoy it, but I just can't (especially at 50% of my saturated fat for the day). I'm sure this works for some people (and feel free to chime in if some brands are better than others), but this does not work for me. It wasn't super potent, but it didn't matter, I just couldn't get use to it. I made the grave mistake of trying to mix it with some milk - It was truly awful. It reminded me of the original flavor of Kaopectate and was quickly disposed of. 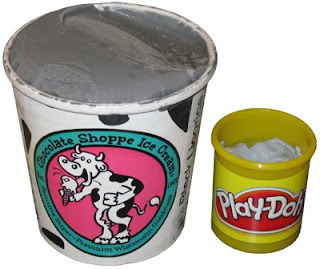 Ok, I may not have brought you a quality review today, but hopefully I brought you a chuckle, I certainly had a smile on my face playing with the ice cream and Play-Doh. Oh, and no, the play-doh isn't melting, that's just a little fun with photoshop. I also love licorice but not sure how I'd feel about this...I'd certainly try it. Your daughter sounds like a genius to me ...""YUCK!" She was thrown off by the color but was a good sport and tried a quick bite (she went on to have some peanut butter cup ice cream)"
hehehehe, yes she is, the blog wouldn't be the same without her! Color reminds me of the Black Sesame gelato I had once at Paciugo. It was... different. I actually LOVE Black Licorice ice cream. It was my favorite back in the 1960's when I was a kid.... it's VERY hard to find these days... it normally is "black".. not grey.. and when you are done with a cone.. your tongue would be black. Absolutely love black licorice ice cream.